Yesterday morning, our family got up, ate breakfast, grabbed some healthy snacks, strapped on some running shoes and headed to a local park to participate in a race. Okay, technically, only the kids were wearing actual running shoes but that’s not the point. If it wasn’t freezing cold out, I would have put running shoes on also. Fine. You’ve got me. That’s a fib, too. 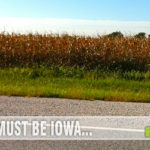 I had no intention of running in the race yesterday morning. As I’ve said in recent posts, I’m working on improving my running but entering a race when it’s ridiculously cold out isn’t how I want to start. The girls did okay coming in at just over 8 minutes. It’s a good time, but certainly not their best times. Unfortunately, they hadn’t practiced at all this past week because we had company in from out of town. For that same reason, they hadn’t eaten as well as we usually do. We’re all well aware, even the kids, that what we eat plays a big part in how our bodies perform. So last night, when they wanted a snack, I decided to change it up a bit from what they usually have. We always have fresh fruit around the house but we purchased a heap-load of bananas for our guests. A few too many. 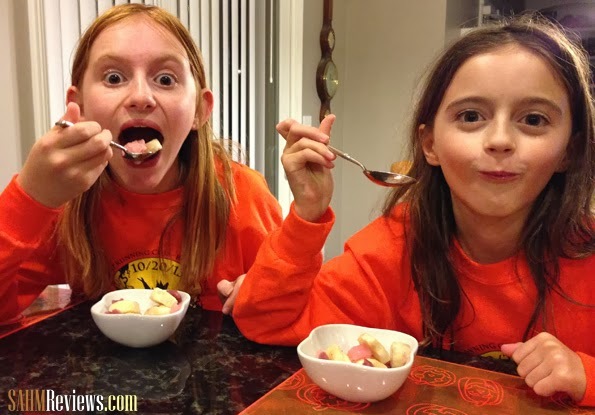 The girls prefer bananas mixed with honey, peanut butter and mayonnaise but since it isn’t the healthiest option, I only like making that for them on special occasions instead of regularly. 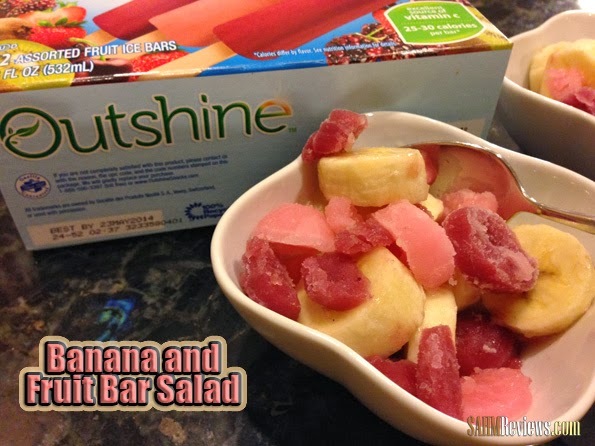 I decided to chop up some Outshine Fruit Bars to mix with the bananas and create a unique healthy snack. There are several flavors, so I let them choose which sounded best to them. We grabbed two from the “no sugar added” variety pack. Not only did it give the bananas a fresher taste, it seemed like a treat to the girls because it’s something they usually would just by itself. It went over really well albeit very cold. Eating a fruit bar in a customary fashion (straight off the stick) isn’t exactly fun when it’s so cold outside. Chopping it up and mixing it with other stuff gave the kids a sweet chilled dessert! While I was chopping it up for the kids, I had a great thought. Chopped up fruit bars would be great in a drink! By cutting down the middle, I was able to free the stick very easily and cube the entire bar into fruit “ice” cubes. I happened to have four different boxes in the freezer and looked through each to figure out which would be best with the beverages I had on hand. The pomegranate fruit bars sounded best so I decided to give those a shot. The first thing I discovered is that the fruit cubes looked very elegant in the glasses! If you’re one that likes to entertain, having a selection of Outshine Fruit Bars in your bar freezer will liven up your drinks. Think of all the possible combinations! Since I’m not a big fan of rum, I figured a little added flavor would improve it for me. While it was beautiful, it was still too strong for me. 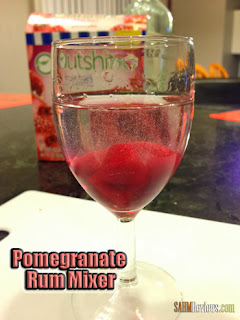 Someone who likes rum and mixers would probably like this chilled option. Then I poured Moscato. It’s one of my favorite drinks. It was tasty, of course, because…well… I like Moscato! Since I was testing out other stuff, those fruit cubes gradually started to melt and I realized that Pomegranate Moscato Chiller is AMAZING. I left the glass alone until the cubes had completely melted then had to resist the urge to pour another glass. Finally, I made my favorite mixed drink. Amaretto Stone Sour. It’s merely Amaretto, Orange Juice and Sweet & Sour Mix. Most people are used to Amaretto Sours but here in the Midwest, a “stone” version is more common. The only difference is the Sweet & Sour Mix. My rendition, which had Pomegranate Fruit “ice” Cubes, is even better! If they served that at a bar, I would order it in a heartbeat. But since I have all the ingredients here at home, I don’t need to. I can just make it here. Ultimately, what I discovered is that an inexpensive box of real fruit bars can make even common stuff extraordinary. The girls enjoyed their dessert (as did I) and both DH and I thought the drinks were awesome. 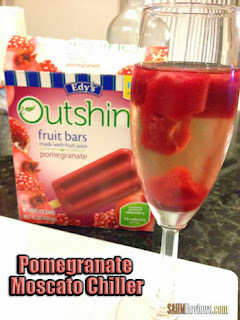 For more information on the variety of flavors of Outshine Fruit Bars, visit their webpage. You can find them at stores under the brand of Edy’s or Dreyer’s depending on your geographic location. Follow Nestle’s Twitter account and or Outshine on Facebook. You came up with some cool creations. 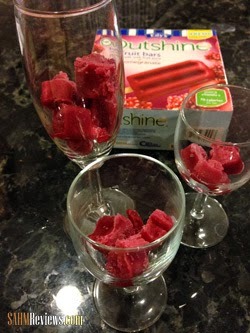 I can't wait to try fruit bar ice cubes in my drinks. This looks awesome! Definitely gotta try it! I want all of those drinks! That is such a cool idea. Will probably try at least one for the holidays. That does look like a great treat! I’m glad the girls got treats and that mom got her treat, too! Looks yummy! 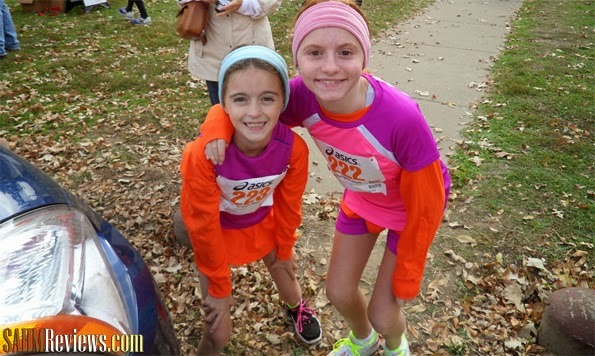 Your little runners are too cute. I love the idea of taking something simple and truly making it your own. Plus you made it tasty and fun! 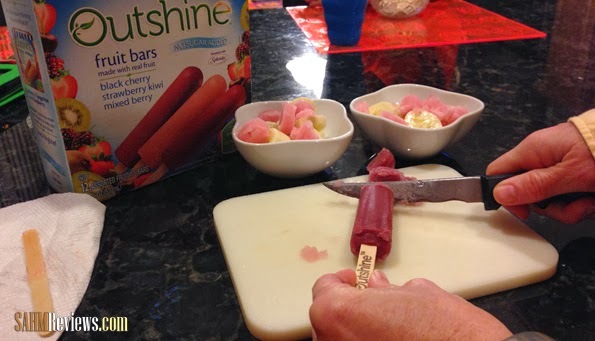 Mmm…I never would have thought to cut up a frozen fruit bar – great idea! 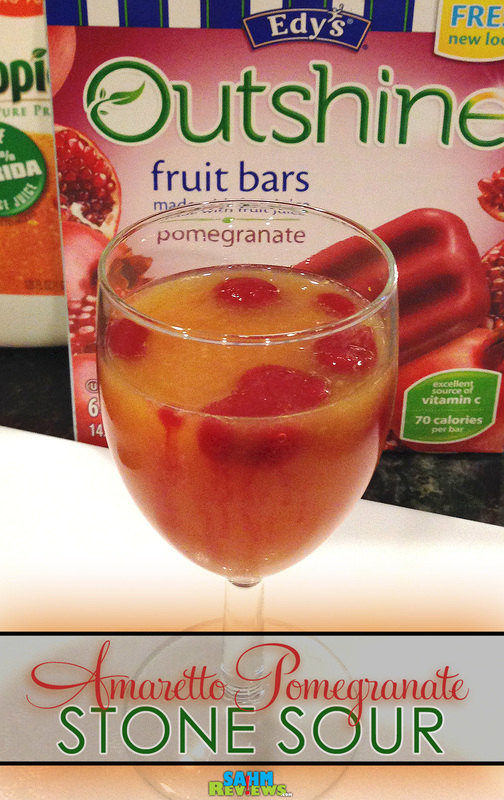 Mmm… I never would have thought to cut up a fruit bar – or use it in a drink! Great idea! I’m a big fan of fruit bars! I haven’t tried these yet! That looks so good and healthy too! We usually throw frozen fruit into the blender to make smoothies, I’ve never really thought about making a frozen fruit salad before! That is brilliant! Never thought to cut them up like this!! I love those fruit bars!! sounds like they had a lot of fun!!! And a nice refreshing treat, what a great idea! I love those bars, never thought to add to a drink like that!! Yum! Never thought of using fruit bars like that before. Thanks so much for sharing the ideas. Oh I adore those Outshine bars! I actually have a box of them in my freezer right now! I could totally do this! I love the snack you made for your kids. I bet the fruit cubes would be good in a glass of sprite or something like that too, for kids parties. i’m loving the idea of having this in wine. or champagne for brunch! You just showed me summertime! 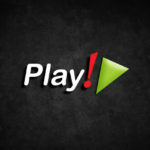 I can’t wait to try your ideas! love this idea of cutting them up and using them into ice cubes, my kids would get a kick out of that! I like how you cut up the bars for ice cubes. I bet that tastes great! 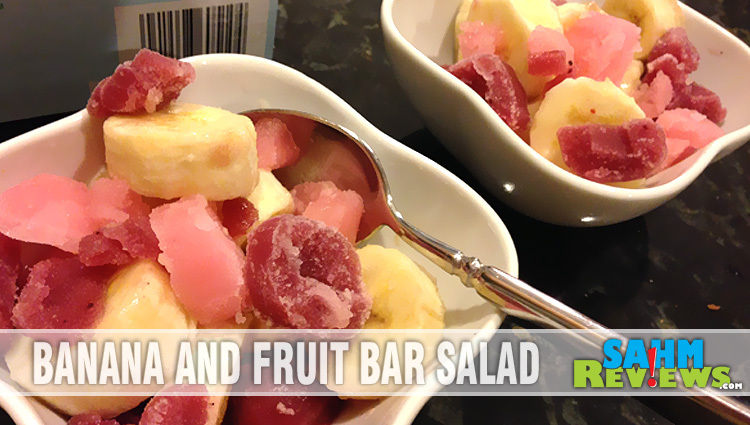 I prefer the fruit bar to the mayo with my fruit LOL – I am so going to use this idea of fruit bar as ice cubes!! What an amazing idea. I love the ice cubes and fruit salad. My DD’s would go gaga over this. Those were both really good ideas! I could go for the drink right about now! 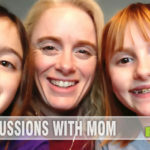 All Moms deserve a Mommy treat once the kids are in bed! They look delicious! This look so delicious. I never thought of using it as ice cubes. I haven’t had a chance to try these yet, but they look really tasty! I loke the idea to use them in mixed drinks, too. I’ve had these and love them but I never thought to cut them up and do more with them! Love it! 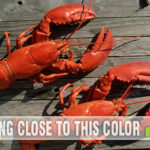 I bet those would be good in a glass of champagne. How clever! I know my son would love to see me do this for our Texas summers! What a great idea. It looks like the girls really enjoyed it. Love this! I think my daughter would really like the ice cube idea! Such a simple yet healthy idea! I never would have thought to put Popsicle into my drinks! I need to try this when the weather warms up. I can ust imagine the heaven it’d bring. What a great idea! I would never have thought to use them as you have!! Oh what a great idea, my kids would LOVE this! What a wonderfully simple, yet tasty idea. Thank you!!! I bet the kids would really like them with orange juice, or even just water! I don’t know about the water though. It might weaken the yumminess of the fruit bars. The Amaretto Stone Sour sounds good. I’ve lived in the south my whole life (nearly) and never even tried one! Oh man, that is brilliant. I never thought to added fruity pops like that to a drink! Great summer breakfast treat!! I saw these at Target the other day, I bet my son would love them and they are way healthier than sugar based Popsicles. What a great idea for a healthy snack! Have to try it out too! I’m sure my daughter would love it. These fruit bars look very tasty. Thanks for sharing!